Aug. 27, 2018 - Ponsse unveiled two new machines, new features and a 1.3-hectare expansion of its manufacturing plant in Vierema, Finland, last week, bringing 55 international journalists to the scene. CFI was on hand to see the new Cobra harvester and the first CVT forwarder on the market, the Ponsse Bison. Ponsse's new Bison forwarder has a continuously variable transmission. According to the Finnish forest machinery manufacturer, the new Ponsse Bison forwarder is likely to create a small revolution in forestry thanks to its continuously variable transmission, which allows to go from zero to 20 km/h without shifting. 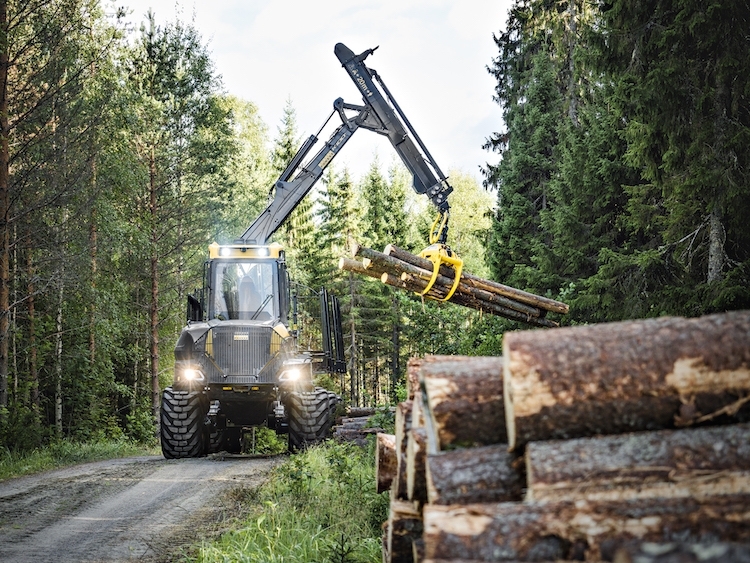 “This is an evolution as important as what we did with the Scorpion harvester because it is the first CVT forwarder on the market,” says Ponsse’s Antti Riskinen. The Bison forwarder has a capacity of 16 tonnes and it is equipped with an “Active Frame” cabin, which levels the position of the cabin for more operator comfort. As well the lubrication of the transmission is pressurized, which improves performance in difficult conditions, especially on steep slopes. Equipped with a six-cylinder engine, the new Cobra harvester is more powerful than the Fox. According to Mattila, this machine is likely to take the place of the Fox as a more efficient way to achieve commercial thinning, while still an effective machine for clear cutting. With an H6 harvesting head, the Cobra has a range of 11 meters (the Fox is 10 metres), which allows the machine greater reach from the road. It is also possible to mount H5 and H7 heads on the Cobra, but the range is reduced to 10 metres. There is just one hydraulic pump on this harvester, unlike the Ergo which has two. The Elephant and Elephant King carriers can now be used with a new loader, the K121, which offers more power and more speed for handling logs, with a lifting power of 195 kNm. Controlling a Ponsse carrier has never been easier than with the new Ponsse Active Crane feature, which allows an operator to control the movement of the grapple instead of having to adjust all the individual functions. One lever controls the height of the grapple while the other controls the direction. The system takes care of lifting, folding or lengthening the crane.